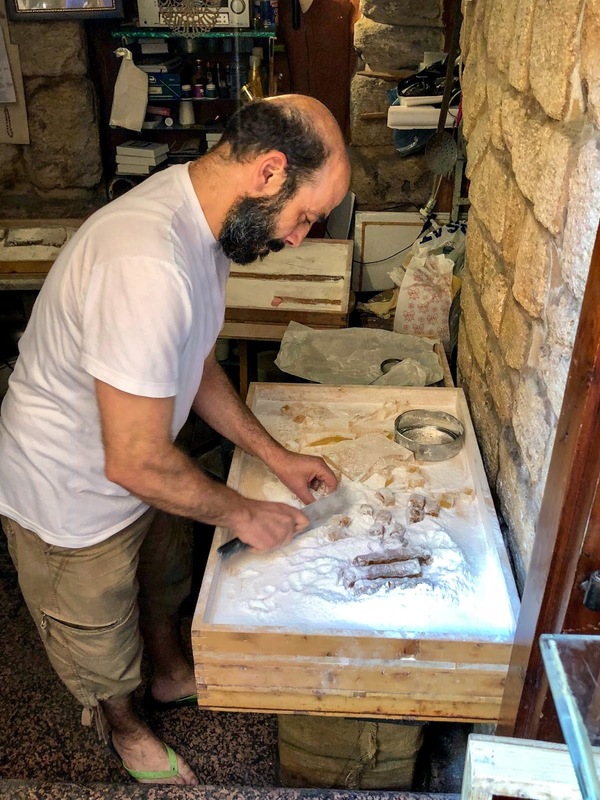 On day three in Lebanon, we loaded into our van and headed south from Beirut to the city of Sidon. Sidon is a beautiful coastal town with a rich historical heritage. It is mentioned several times in the Bible and the Apostle Paul and Peter both visited here. The drive along the Lebanon coast was beautiful! 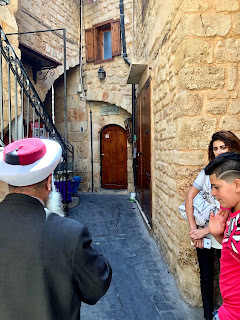 When we arrived in Sidon, we went to visit a judge who presided over family court matters. He was a friend of our host and was the Muslim Imam in Sidon. His name was Mohamed. His office quarters were brand new and freshly remodeled. It was a small room with theater-like seating. Mohamed was a major leader in Sidon! I couldn't wait to meet him! When he walked into the room I noticed his spectacular beard, very nice robe, and Fes Sarik head covering. He greeted our host and welcomed us to Sidon. He was very kind, gentle, and very educated. He has written at least 15 books on a variety of subjects. One of those books chronicled his first visit to the USA. He told us that story and how his experience in the US was very different from what he had always been taught. Growing up, he was taught that all Westerners were the same. He clumped people from the US and the UK into the same category. Before he visited the US, he wondered how he would be received. Would he be welcomed? Would people be hateful towards him? But what he found was that most people were very kind and welcoming. He learned that people in the East were a little different than the West. The North and South had their own flavor too. What was common though was that most people were very kind and friendly. 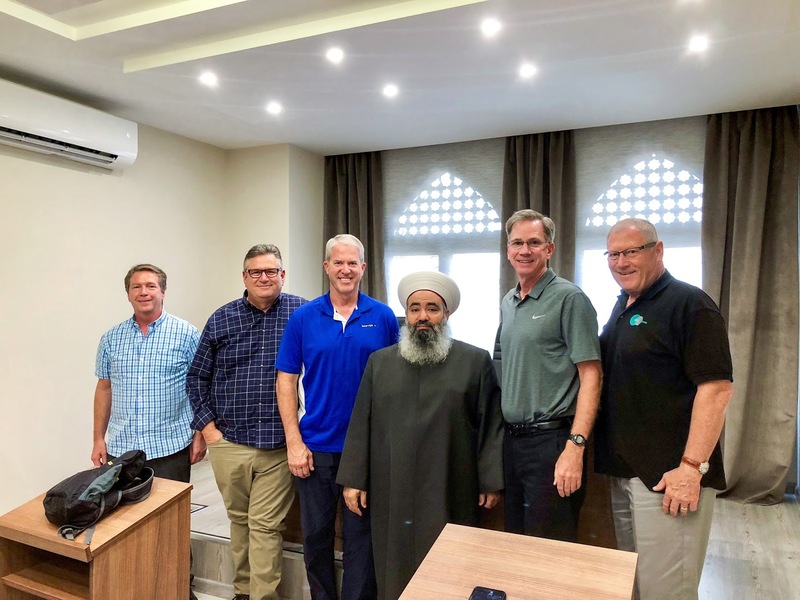 As he was explaining this trip, I couldn't help but think of how many people in the US have their own stereotypes of Muslims in the Middle East. Our news is filled with sensationalized viewpoints of extremism. The more I travel, the more I realize that these views do not represent the large majority of Muslims in the Middle East, or at home for that matter. Unfortunately, I think we have let the polar extremes of viewpoints dominate our media thought process. It's embarrassing and it makes me sad. I found that before my trip to the Middle East, I shared many of the same thoughts as my new friend from Sidon. How would I be received? Would I be welcomed? Would people be hateful towards me, an American? I learned first-hand, the same lessons that Mohamed did. I was very welcomed and people were very friendly. You know, loving God and loving others will become a lot easier when we start viewing people the same way that God does, as the human beings that God created in His image. Our new friend Mohamed would end up being our tour guide for the day which was amazing. I'm not sure anyone knows more about the history of Sidon, including its rich Biblical history. 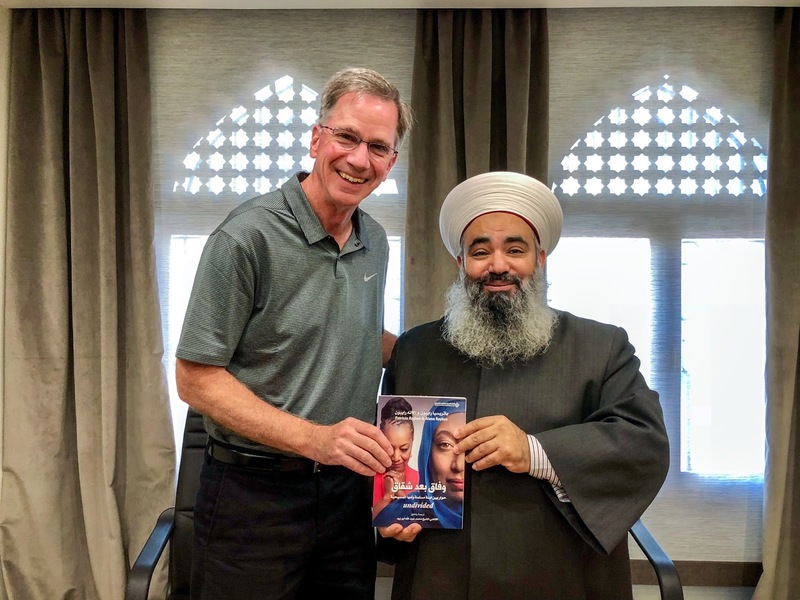 I was quite impressed that Mohamed was so well versed in Biblical teaching. He quoted the Bible with an amazing familiarity and focused more on the things Muslims and Christians had in common than where we differed. I found that quite refreshing as a starting point for dialogue and getting to know each other. I realized that although Mohamed and I had a very different view of God the Father, Jesus the Son, and the Holy Spirit, there were many things we could agree on, which produced a rich dialogue for getting to know each other, something I would not have experienced had I built up a sad boundary fueled by right versus wrong or good versus bad. For anyone reading this who lives on the far extremes of viewpoints on this subject, let me say this because this is an injustice we must correct in our society. Muslim does not equal Terrorist! I shouldn't even have to say that, but the sad fact is, some people have bought into that thought and I believe that is its own form of evil and hate. We must love as God loved! Sorry, I had to get that off my chest. I get kind of fired up about injustices in the world! Mohamed took us to the old historic part of Sidon where we got out and went for a walk. We went up on rooftops with incredible views of the ocean and walked through tight, cobblestone streets with markets, churches, mosques, and temples. I learned that is quite common for all of those things to be only a few meters apart from each other. At one point we walked up to a church with lots of history, St. Nicholas Cathedral. Tradition says that it was here that the Apostles Peter and Paul had a discussion about the Great Commision. Peter was more Jerusalem centered and Paul's focus was more focused on reaching the whole world. Looks like Paul ultimately influenced this conversation as Christianity would spread around the world. Just to stand in front of this church was cool thinking that these two Apostles had walked these streets. Immediately outside the church was a little "sweets" stand where a man was making "Turkish Delight." I'd never really heard of that before but we got to taste it. It was like a soft candy or taffy that was covered in powdered sugar. It was quite good so I bought a box to take home. The tour of historic Sidon ended with a visit to the local Mosque where Mohamed served as the Imam. The inside was nice, but simple, a trait that makes up most mosques. He showed us where he would stand to preach each week. On the wall was a very unique clock board that listed several times in the day. Those were the times throughout the day when people were called to pray. If I remember right, there were six times listed on this board. I guess number 6 was above and beyond. 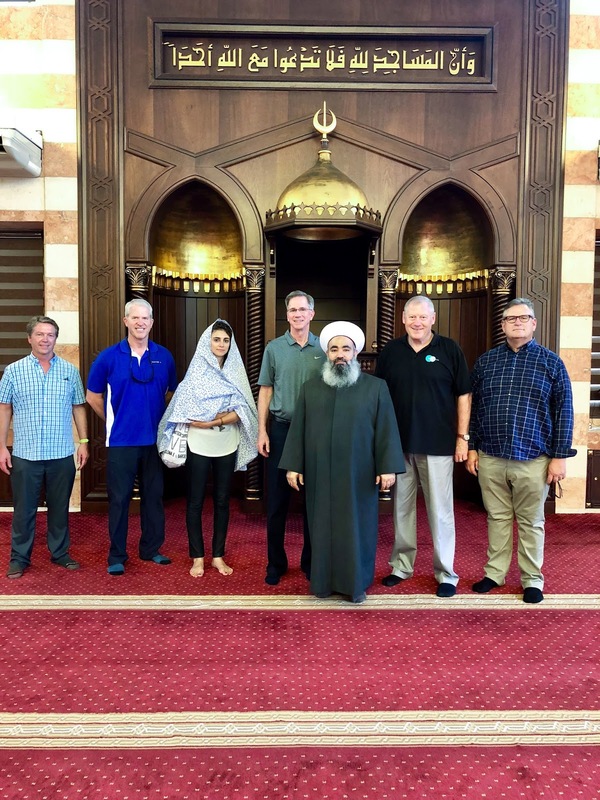 After our tour of the mosque, we loaded the van and headed back to Beirut. I had so many thoughts going through my head. I had experienced a wonderful day in a famous historic Middle East city, met a Muslim Imam, visited a historic Christian church, and visited a Muslim mosque. I had a deep sense that stereotypes and labels are not helping our world love each other. We can do better! I can do better and I MUST do better at loving the world God created! As I pondered these things, the thought came to me that the only sure way to bring peace to the Middle East was to LOVE and FORGIVE. That's why I am a follower of Jesus because His ways work! Refugee camp #2 - Where is the hope?